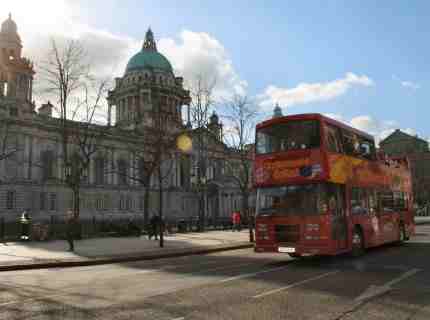 Belfast Tours include the popular Belfast City Sightseeing Tour. Open city sightseeing tours by bus are popular in Belfast and there are numerous options for day trips to famous attractions such as the Giant's Causeway and Carrick-a-Rede Rope Bridge if you are planning your Ireland tours. They specialise in providing private and bespoke tours in the city of Belfast. Some of the advantages of the bus tour are that you can hop on hop off anywhere you wish and they are covered for the poorer weather! Belfast City Sightseeing Tour offers a hop on / hop off city tour and provides you with a comprehensive look at our very special city. Your ticket is valid for 48 hours, to allow you to explore every area and district of this unique place. You can start your tour from the heart of Belfast City centre. They are the leading tour operator in Belfast, Northern Ireland.